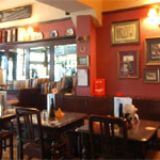 Popular Farringdon pub the Hoop and Grapes offers a fine choice of drinks alongside a food menu of classic British fare. They also have a patio ideal for alfresco dining or drinking. Do you work at Hoop and Grapes? Outdoor TVs and WiFi throughout the premises. Heated and covered patio and balcony. What did you think of Hoop and Grapes? A secluded drinker's haven on Farringdon Street, Hoop and Grapes excels with excellent British cuisine and a laid-back atmosphere. 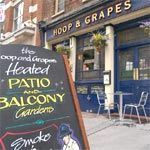 Hoop and Grapes can be found at the south end of Farringdon Street, near the intersection with Fleet Street and the City Thameslink station. A quaint blue exterior and hanging flower baskets do little to distract from the heavy traffic just a few steps away, but once inside (mind the step! ), the climate-controlled interior is secluded and distinctive enough to be a world unto itself, decorated with old books, wall-length mirrors and fresh-cut flowers – a nice touch. 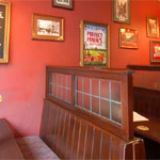 Sturdy wooden furniture sits adjacent to the main bar, which holds row after row of spirits alongside a collection of beer mats and a flat screen TV on the back wall, while a series of booths further into the room provide ample seating for meals or just a quick pint or two. This leads on into a spacious beer garden, and additional outdoor seating is available upstairs on the balcony. Meanwhile, the first floor bar is relatively small but lovingly decorated, and ably supplies a homely, well-lit dining room. 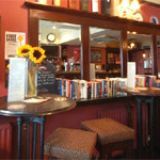 Nominally a City pub, Hoop and Grapes is actually a world away from the impersonal chain pubs of Bishopsgate and Fenchurch Street, with a relaxed atmosphere and unpretentious attitude combined with an eagerness to please. Customers are invariably well-meaning and courteous, while staff are friendly, knowing their football as well as their wares. The music selection is spot on, but televised sport is a major attraction, even if it’s never overly intrusive. Private functions can be catered to on request. Excellent, inexpensive British food is the order of the day from 12pm onwards, with the main courses (£6.50-9.50) proving to be both filling and tasty. The steak and ale pie with peas, chips and patented Spitfire gravy is highly recommended, while the falafel burger is one of a few handy alternatives for vegetarians. Baguettes (£6), jacket potatoes (£4) and sharing platters (£11) ensure variety and versatility for lunchtime and dinner crowds, and value for money is consistent throughout. Asahi, Oranjeboom and San Miguel lead a rather leftfield selection of draught beers (none too cheap either, at around £4.20 a pint), together with more standard ales like Spitfire and Bishop's Finger. Elsewhere, the scope of the bar is something to behold, with a great deal of spirits sitting alongside a hot drinks area, a considerable wine rack (prices start at around £4 a glass), bar snacks and even an assortment of fine cigars for the discerning drinker. Slightly alarming prices aside, there is little risk of disappointment here. Genuinely pleasant and blessed with excellent food and drink, Hoop and Grapes is a veritable anomaly of a City pub - one which certainly warrants repeat visits.